In this series, we have been examining the common market access misconceptions that can create challenges for biotech companies during the drug development lifecycle. In the final installment, we will explore the fourth assumption—if clinical results are great, then the cost of a drug is of no concern. There is a widespread belief that proving clinical efficacy is the only major requirement for a positive reimbursement decision. To confirm whether this was true or not, we used our Market Access Platform (MAP) to evaluate the decisions of health technology assessment (HTA) agencies outside of the US in order to identify how often a drug that receives a positive clinical evaluation also receives a negative reimbursement decision—that is, it is not considered to provide value to the health system. Within our technology platform, we categorize the HTA agencies' overall summaries of both the clinical and economic evidence base. For example, if National Institute for Health and Clinical Excellence (NICE), the UK's national organization, determined that a drug demonstrated a significant improvement in overall survival compared to the comparator and had acceptable toxicity, we classify the clinical summary as: greater efficacy/effectiveness over the comparator. Through our platform, we examined all the assessments from HTA agencies that evaluate both clinical and economic evidence. Among 3,070 assessments, 882 assessments (29%) demonstrated greater efficacy/effectiveness—proving clinical efficacy. Within this set of drugs that proved their clinical efficacy compared to the comparator, we found a total of 155 (18%) of assessments were determined to have lower or worse cost-effectiveness. So, while these drugs were considered clinically efficacious they were not considered to be valuable to the health system. 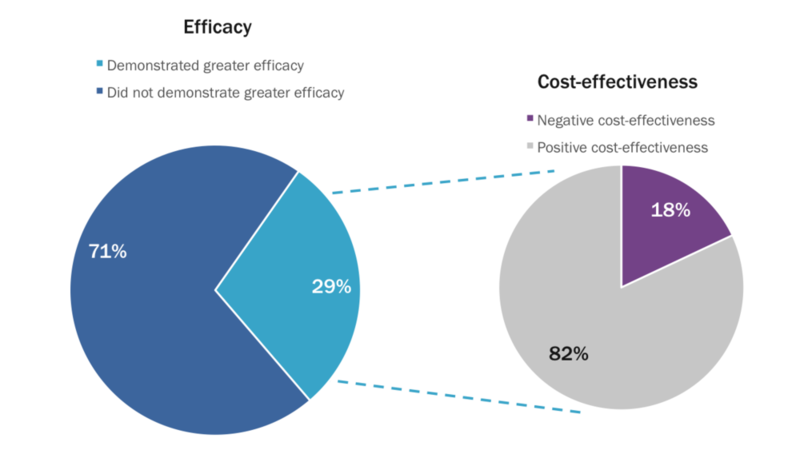 Of the drugs that demonstrated greater clinical efficacy, 18% had negative cost effectiveness. How many of these reviews received a negative reimbursement decision? Positive decisions included decisions where the agency recommended or recommended a restricted version of the marketing authorization. Negative decisions included decisions where the agency did not recommend the indication; this included instances where the agency did not make a decision or deferred the decision. When these 155 reviews are graphed by their decision we see that three-quarters of the reviews were not recommended. So, despite proof of clinical efficacy, the lack of sufficient cost-effectiveness harmed the market access success of these drugs. Jevtana® (cabazitaxel), for metastatic Prostate Cancer, provides a good case study example. In 2011 and 2012, the agencies reponsible for HTAs in Australia (PBAC), the UK (NICE), and Scotland (SMC) all decided not to recommend Jevtana for reimbursement. The source for the main clinical evidence considered by these agencies came from the TROPIC study. The TROPIC study, a randomized open-label phase III study, compared Jevtana to an active comparator, mitoxantrone (Novantrone®). The primary outcome for the TROPIC study was overall survival. The study results showed significantly longer survival for the group treated with Jevtana than for those treated with mitoxantrone. Jevtana was associated with a 30% reduction in the risk of death and increased overall survival by 2.4 months longer than its comparator. Jevtana was also associated with better clinical results for the secondary endpoints—including a greater progression-free survival, delayed tumor progression, and a higher objective response rate. In short, Jevtana was shown to have a greater clinical efficacy over its comparator. However, when the economic approach presented to the agencies is examined, a less positive picture takes shape. In the UK, NICE found that the ICER was more than £87,000/QALY, well above the threshold to be considered cost-effective. NICE concluded that even though Jevtana was an effective, life-extending treatment, the cost-benefit ratio was too great to justify the use of NHS resources. Similarly, in Australia, PBAC found that the base-case ICER of $45,000 – $75,000 was unacceptably high. And in Scotland, SMC concluded that there was not a sufficient justification of the treatment's cost in relation to its health benefits. There is a happy ending for Jevtana. After a resubmission, NICE, SMC, and PBAC all re-assessed the drug and decided to recommend its use in their countries. In 2016 the manufacturer offered a discount in Scotland and the UK that improved the cost-effectiveness of the drug, reducing the ICER to a more acceptable £45,000. Australia also recommended the drug on the basis of acceptable cost-effectiveness. The process to a reimbursement decision can be lengthy, so adding the need to re-submit a new drug price and potentially an updated economic model can extend the time it takes for a drug to reach the market and patients. For Jevtana, it took an additional four years—from 2012 to 2016—before it was made available to patients in the UK. With earlier planning and a critical analysis of HTAs for similar drugs, your drug can get to market in a speedier and more cost-efficient manner. There is no one-size-fits-all solution in market access, especially when it come to market access outside of the US. The challenges will be different according to the setting in which a drug will be used. Only by recognizing how a product fits into each individual market can a customized best approach be created. By conscientiously planning the market access strategy during the early stages of development—from choosing the right indication, the most appropriate comparator, and the most relevant endpoints down to applying the best-fitting parameters to the economic model—the success of global market access improves. Health technology assessment and regulatory data can help guide these decisions and provide a pathway forward for successful launches.